Dr. Oester has extensive experience treating thyroid eye, orbital tumors and more. Schedule your consultation. 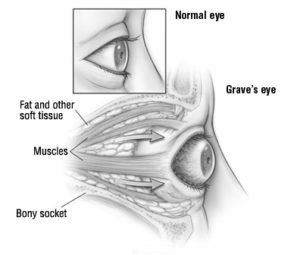 Thyroid Eye Disease (TED) is a condition that is frequently associated with Graves Disease, an autoimmune disease. TED is characterized by inflammation around the eyes that leads to chronic irritation, dryness, bulging of the eyes, double vision, and potentially vision loss. Treatment for TED can range from conservative management with lubrication in mild cases to surgery in more severe cases. Dr. Oester performs eyelid surgery to correct exposure and decompression surgery to address bulging eyes. Orbital tumors are abnormal growths around and behind the eye. A broad range of tumors can form behind the eye ranging from completely benign tumors to aggressively malignant tumors (cancer). Appropriate diagnosis and management is paramount to preserving vision and function. Dr. Oester has extensive experience in the treatment of orbital tumors.